If you like a scientific approach to cooking, this new cookbook is a must-have: The Food Lab, by J. Kenji López-Alt. I am quite fond of his blog Serious Eats, so of course I had the book pre-ordered and was anxiously waiting for its electronic delivery. Since I have no space in any bookshelf at home to store cookbooks, Kindle became my helpful friend. The book is delightful to read, as the amount of “dry” information associated with perfecting a recipe is well-balanced by jokes and short stories. In one of my favorite chapters (Soups, Stews and the Science of Stock) he shares a great recipe for Creamy Mushroom Soup. In that recipe, Kenji tackles the persistent WRONG statement that they should not be washed under running water because “mushrooms are like sponges.” I swear, every time I hear a reputable chef spitting this non-sense I scream at the screen. Who on Earth came up with that idea, and why, oh why it gets repeated over and over? Kenji patiently goes over his experiments washing mushrooms and weighing them. Actually, you can soak them and after draining they will retain between 1 and 2% water, all on the surface. If you are paranoid about watering down your mushroom saute (keep in mind you don’t water down anything with 2% water), dry them slightly with a paper towel, or cook them 10 seconds longer…. Wash your mushrooms, folks! Toss that silly mushroom brush, it’s one big gadget scam. Ok, I feel better now. 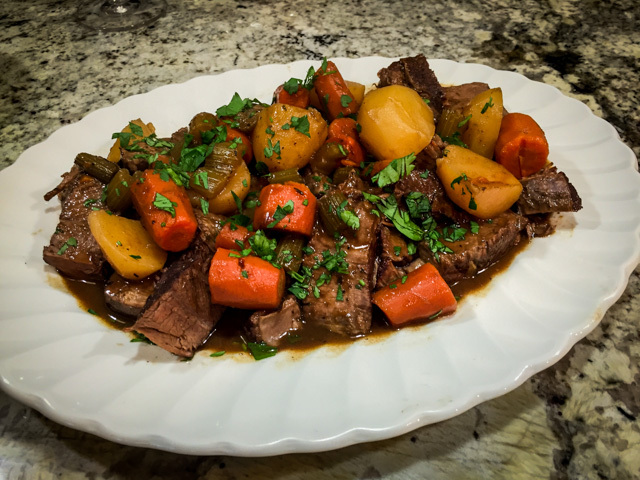 So much better that I will step off my soap box and share with you a great recipe for All-American Pot Roast, perfected in The Food Lab. Adjust an oven rack to the lower-middle position and preheat the oven to 275 ° F. Pat the chuck roast dry and season it with salt and pepper. Tie kitchen twine tightly around each piece at 1-inch intervals to help it retain its shape. Heat the oil in a large Dutch oven over high heat until lightly smoking. Add the chuck and cook, turning occasionally, until well browned on all sides, about 8 to 10 minutes. Transfer the beef to a large bowl. 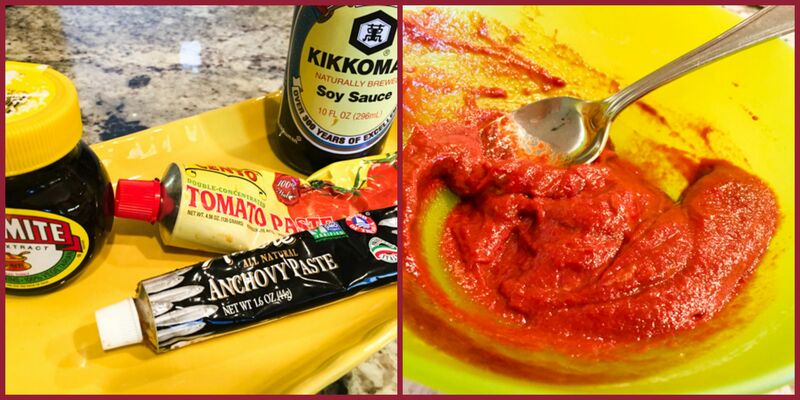 Meanwhile, combine the anchovy fillets, garlic, Marmite, soy sauce, and tomato paste in a small bowl and mash with the back of a fork until a smooth, homogeneous paste is formed. Return the pot to medium-high heat, add the carrots and celery, and cook, stirring frequently, until the vegetables begin to brown around the edges, about 5 minutes. Add the onions and cook, stirring frequently, until very soft and light golden brown, about 5 minutes. Add the anchovy mixture and cook, stirring, until fragrant, about 1 minute. Add the flour and cook, stirring, until no dry flour remains, about 1 minute. Increase the heat to high and, whisking constantly, slowly add the wine. Bring to a simmer and cook until the wine is reduced by half, about 15 minutes. Pour the chicken stock into a large liquid measuring cup or a bowl and sprinkle the gelatin on top. Allow it to hydrate for 10 minutes. Add the gelatin and chicken stock, bay leaves, and thyme to the Dutch oven, return the beef to the pot, and bring the liquid to a simmer. Cover, place in the oven, and cook until the beef is completely tender (it should offer little to no resistance when you poke it with a cake tester or thin knife), about 3 hours; add the potatoes to the pot about 45 minutes before the beef is done. Remove the pot from the oven and allow to cool for 1 hour. Transfer the whole pot to the refrigerator and let rest at least overnight, or up to 5 nights. When ready to serve, carefully remove the hardened layer of fat from the top of the cooking liquid and discard. Transfer the meat to a cutting board. Discard the bay leaves and thyme sprigs. Bring the liquid to a boil over high heat and reduce it until coats the back of a spoon but doesn’t taste heavy. Season to taste with salt and pepper. Meanwhile, remove the twine from the beef and slice it against the grain into ½-inch-thick pieces. Place the pieces in overlapping layers in a 12-inch skillet and add a few ladles of sauce to moisten them. Cover the skillet and set over medium-low heat, shaking occasionally, until the meat is heated through, about 15 minutes. Transfer the meat to warmed serving plates or a large platter and top with the cooked vegetables and more sauce. Serve immediately. Comments: The whole idea behind this recipe is to boost the amount of glutamates, creating what he calls a ‘umami flavor bomb.” Kenji noticed that components that bring umami to a dish act in fact synergistically, so by adding several of them to the dish, you’ll get a real boost in flavor. In this version, two very unexpected items are included: anchovies and Marmite, the “love it or hate it” ingredient more commonly found in light smears over buttered toast. I confess to modifying his basic recipe a little. For starters, I added a lot more carrots because we adore them in our pot roasts. And I used only half a bottle of wine and half the amount of chicken stock/gelatin. It covered the meat from the beginning and seemed perfect in the reduction stage of the sauce. I also cooked the roast longer, for a total of 4 hours. By that time the meat was really tender the way we like it. My only other modification was to finish the dish with fresh parsley added right before serving. It was absolutely wonderful. comfort food at its very very best! Dinner is served! 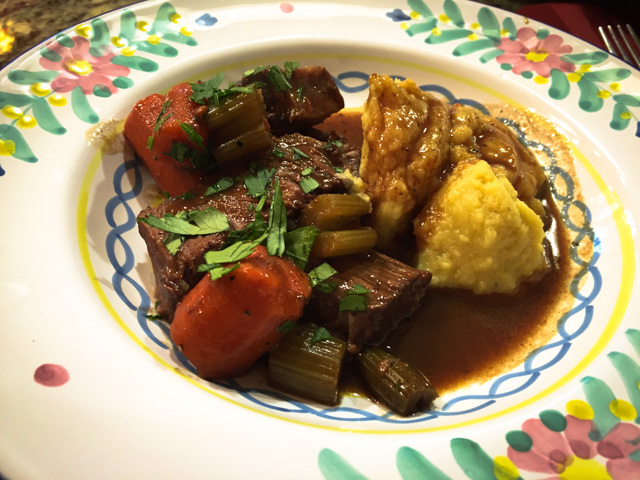 Pot Roast with Golden Cauliflower Puree…. Kenji, thank you so much for giving me permission to blog on this luscious pot roast… I have way too many things I’d like to make from your book, like the Lemon Ricotta Pancakes. They are calling my name super loud! Of course, I will have to follow your instructions to make my own ricotta, which is a project I’ve been flirting with for a long time. If you want to order the book or read more about it, click here. THREE YEARS AGO: October 16th: World Bread Day! I love making roasts once the weather changes toward chilly fall nights, and this one is going to be the first this season. I love Kenji’s posts and will no doubt buy this book too. Long ago I realized it’s stupid to worry about a little water on mushrooms, and that a mushroom brush is one gadget too many! Thanks for pointing that out to everybody. Were you able to find Marmite in a local store? I think I’ll have to go online for it, although our winter home is in a ski town where we have a lot of British and Aussie visitors, so some local store might stock it. I love adding anchovies to various dishes as an unexpected flavor bomb, and people never suspect, but do love the deep flavor. Hello there, Paula! Yes, I found Marmite in our grocery store in two sizes actually… if you stop by Manhattan to see us on your drive in November, I’ll get you a bottle, how about that? This is a classic and at it’s best! If only my mom’s pot roasted looked (and likely tasted) as good. (Shhh! Sorry mom.) I was never a fan of this growing up. Perhaps because it didn’t have all the umami ingredients, or maybe because it seemed like we ate it all the time. I have gained an appreciation for it as I’ve gotten older though. This version looks like one I would really enjoy. Serious Eats is a great site. I’ve found many a recipe I love on there! My Mom’s post roast back when she cooked was outstanding, but very simple – I liked the additions of this recipe, the intensity of flavor in the sauce was amazing! I wash or peel my mushrooms if they have lots of poo compost on them. I’d rather have a rinsing than eat that stuff. I love this pot roast and it screams to me how much flavor it has. Kosher Meats must be used but everything else is Kosher. The recipe in the Food Lab cookbook calls for 275 degrees, not 225! Does it have to rest overnight or can you serve after resting an hour? I couldn’t resist getting his book last year. He’s amazing!